If you started a small business recently there’s a chance you’re still looking for that big breakthrough, they key to success. We’ve all been there and done that: passionate about the products or services we are offering to the public but lacking in the acumen and experience needed to run the business side of the enterprise. Many will get there eventually through sheer hard work and just surviving the challenging times. But there’s another approach and it’s learning from those who have discovered that special factor, they key to success. There are a myriad such offers of advice these days, especially online, and some are better than others. But a few stand out and if you can find the time and make the effort to check them out do so. Next Wednesday, April 10 will be one such golden opportunity for owners of local startups, whatever it is you’re selling. Trung Bui, left, with a franchise partner in Nowra. 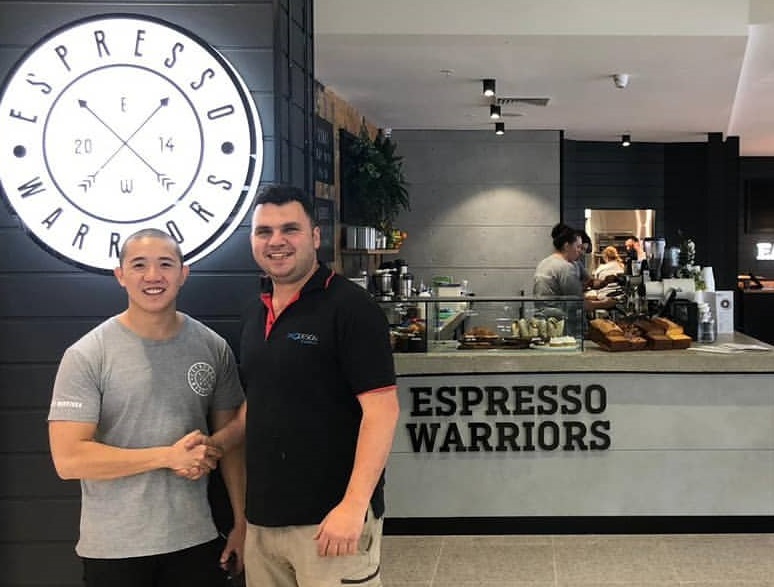 The guest speaker at the Ingleburn business chamber monthly meeting at Ingleburn RSL Club will be none other than Trung Bui, the CEO and founder of Expresso Warriors. As well as hearing Bui tell his story of how he made Espresso Warriors a success phenomenon in a few short years, you will be able to ask him any questions you may have. The dinner meeting will start from 6.30 and finish at 8.30pm – just two hours of your time invested in hearing how someone like the Espresso Warriors founder made it all work. Book your places online here and see you at Ingleburn RSL next Wednesday night, April 10.